We get a lot of inquiries on a regular basis, and it's blindingly obvious (pun clearly intended) that most of you are most interested about backlighting. 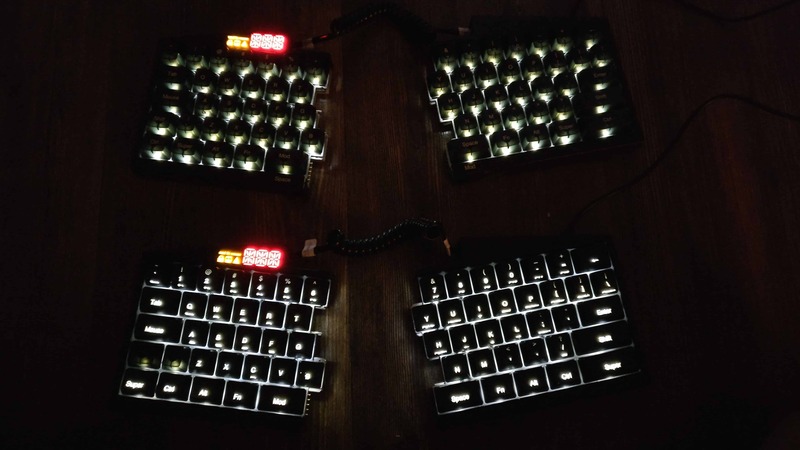 In this post, I'm about to write everything you ever need to know about UHK backlighting. First off, let me make it clear that currently we don't offer a backlit UHK version. The reason is that right now, we're solely focused on delivering the (non-backlit) UHKs, palm rests, and modules to our awesome backers. Everything else will follow afterwards. In the above pictures, the top UHK features opaque keycaps and the bottom has backlight friendly keycaps. Please note that these pictures are a bit misleading because in real life the brightness of the opaque keycaps is much dimmer than of the backlit keycaps. It's also worth noting that the final backlighting will be better. We'll optimize the placement of symbols for more even light distribution and carefully choose the best LED. The most important takeaway is that opaque keycaps may suit some, but probably aren't a great choice for most. In order to make your UHK backlit right away, you can purchase a number of LEDs and solder them to the PCBs. You will have to use 3mm (T-1) LEDs. Be careful to choose a LED type whose rim is not larger than the lens itself, otherwise the LEDs won't fit into the keyswitches. Also make sure to use single color LEDs as bicolor LEDs won't work well. You can pick any LED color but LEDs of the same forward voltage should be used, otherwise ghosting may occur. Fear not, we'll provide detailed instructions for soldering. Alternatively, you can wait for our backlight upgrade kit that we'll release later. The backlight upgrade kit will contain white LEDs and a backlight friendly keycap set. In the beginning, we'll only provide US ANSI and ISO versions. As for the release dates, we're really not sure yet. We'll probably release the backlit UHK version and the backlight upgrade kit about a year after delivering the first batch. We're also unsure about the price but it will be reasonable compared to the price of the UHK. It's worth mentioning that although backlighting is a nice feature, the labels of non-backlit keycaps are easier to see in daylight. Multiple brightness settings will be provided. One is a global brightness setting of 100 levels that affects every LED including both the LED display and the LEDs beneath the keycaps. The other is a per-key brightness setting of 256 levels which will enable us to do all kinds of fancy animations. This per-LED brightness setting can also be applied to the LED display as a whole. The formula is: actual brightness level = global brightness * per-LED brightness. We plan to implement RGB backlighting eventually but surely not anytime soon, as it will require a complete redesign of the PCBs. We also got a question about whether it's possible to solder only a couple of LEDs, for example only the LEDs of the home row. While it is possible, it will likely cause ghosting issues when using different per-key brightness values. This problem can be solved by telling the LED drivers which LEDs are actually present. We can implement a related user interface in Agent to mark individual LEDs populated/unpopulated, but we will only do so if there will be enough interest for this seemingly special use case. Lastly, I'd like to note that while backlighting is clearly a neat feature, it's not necessarily better than not having backlighting. In broad daylight, the letters of the opaque keycaps are easier to see than the labels of the backlit keycaps. This is also true when the backlighting is off and simply backlit-friendly keycaps are used due to their material. So this is it! Hopefully, all your questions are answered now. If not, please ask away in the comments. Have a beautiful weekend! When I first saw UHK I was hopeful it would have backlights to highlight the active layer's available buttons – that would be cool and would ease the learning. This probably gets us closer to having it so! I like the idea! It'll probably be even more useful with RGB lighting in the future. I assume LEDs will be next to switches? How much space will be around them? Moderate soldering skill will be ok? By the way i'm just wondering if there is possibility to send keyboard without keykaps putted on? I have plan to use noise orings like this http://imgur.com/FJ62Ff3 and have experience that taking off the keykaps gives chance to damage them – what about that? Can't wait for shipping – uhk looks promising !! Great work out there! The LEDs go through the MX switches, and there will be plenty of space near the pins of the LEDs, so moderate soldering skills should definitely be sufficient. Thank you for your nice words and support! Awesome! Because this is the maximum brightness and you'll be able to dial it down. I'm sure everyone is expecting future versions, but we are several months behind already, please stick to the plan. We're indeed heavily focused on delivery. The LEDs don't take any significant amount of time compared to the rest of the project. We're doing our best to deliver as soon as possible. This was an incredibly complex Kickstarter project. Based on the updates this project is exactly where it should be. When I saw the initial schedule I knew it was incredibly aggressive. When you back something on Kickstarter you need to know what you're getting into. Shipping anywhere close to the original schedule would have resulted in a poor product. Thanks for keeping us up to date and making something that's going to be useful on my desk while I code. Thank you so much for your support, Leif! I understand that the priority for you is to finish the keyboard, as pointed out already delayed several moths beyond the initial estimated date, what about additional keyboard modules? Judging from the monthly news entries you provide not much have been done with regards to them. How do you plan a delivery for the people who ordered keyboard and modules? Keyboard first then modules? 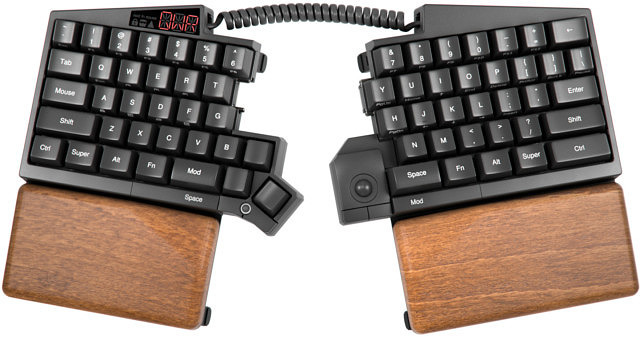 You nailed it right on the head: keyboard + palm rest first + extra cases first, modules second. You can see the expected delivery dates on our Crowd Supply page on a per item basis. Speaking on the progress of the modules, we've just finished the first mechanical prototype of the key cluster and trackball modules. You're welcome to hop over to one of our social media channels (Twitter, Facebook, Google Plus) to see them. We'll write more about them in our upcoming update. Seems like nobody understands crowdfunding. It's just like the stockmarket, you invest in a company so they can spend the money to create products. With crowdfunding you also invest in a company (and in this case a startup!) and get a product instead of a yearly interest. And that product only exists in the minds of the people who founded the startup, there is no physical product. If you want a new product and use it almost directly or you can wait for some months, go out into the market and buy one! there are plenty of products there, but don't spend your money on a crowdfunding project to develop a new product. And don't forget, every company can go bankrupted, the government won't save it (unless you are a bank of course) and you lose your money. It doesn't matter if you are on the stockmarket or on crowdfunding. The big point here is that with crowdfunding you invest mostly in startup companies, mostly with young people who are going to save the world with their new product (they think). And after they are funded, they start to feel the pressure to deliver and walk into a lot of de development-cycle-trouble. Also with several blog-updates many people asked about backlighting, so basically it's your fault to distract them with this kind of questions. So please, stay calm, and trust László and his colleagues that they will deliver. You've seen the progress with the monthly updates and twitter updates, so personally I'm confident that I have a UHK this year! P.S. I'm not in any way related to the UHK-company. Thanks for your support, EdbO. Great insights! Are you leaving out the LEDs on this first model because it would cause fail the emc test? When I ordered this keyboard I was under the impression that it was backlit, but I didn't quit after learning that I was wrong because of the open hardware/firmware. I just hope I don't damage the keyboard when trying to solder the LEDs. We're leaving out the LEDs because it'd take extra time to select the best LED type, source backlit-friendly keycaps, and design them for optimal light distribution. Right now, we're solely focused on releasing the non-backlit UHK model. The backlit UHK version already passes the EMC tests, so luckily this isn't an issue at all. I'm sorry that you believed that the first UHK model was backlit, but we surely haven't ever made such a statement. Given basic soldering skills, chances are very slim that you will damage your UHK when soldering the LEDs. Lastly, thank you so much for your support! Can one use 2x3x4 square LED's ? Looks like this is possible, but we haven't tried it yet. Also, due to the significantly lower height of 2x3x4 square LEDs compared to 3mm (T-1) LEDs brightness may be a bit weaker. IMHO backlighting is not important since I don't look at my keyboard when typing. I have one advice regarding your future choice of the appropriate LEDs and minimum possible brightness level. So far, almost every backlit keyboard that I have tried used unnecessarily strong backlight level at the lowest possible setting. Basically, the only usable level during semi-bright evening was the lowest possible level. And when there was no other light in the room, the backlight was unpleasantly bright (at its lowest possible level). It made the backlight almost useless in this very important use case. So, just keep in mind that the lowest possible brightness level must be *extremely* small, just so that it is barely visible in the full darkness. Thanks for the great advice! I think the UHK is doing very well in this department because its backlighting is unusually high resolution, allowing you to precisely fine-tune the desired brightness level. Hi. In the firmware/agent program will it be possible to set keys in the FJ later or something that would allow us to toggle backlighting on or off? Maybe adjust the brightness? Ideally I'd love to be able to have three or 4 preset values to switch between (off, dim for dark rooms, and full brightness). Configurable brightness keys are planned, and we will implement them eventually. Brightness presets are not planned yet, but we'll implement them if there will be a decent demand for them. 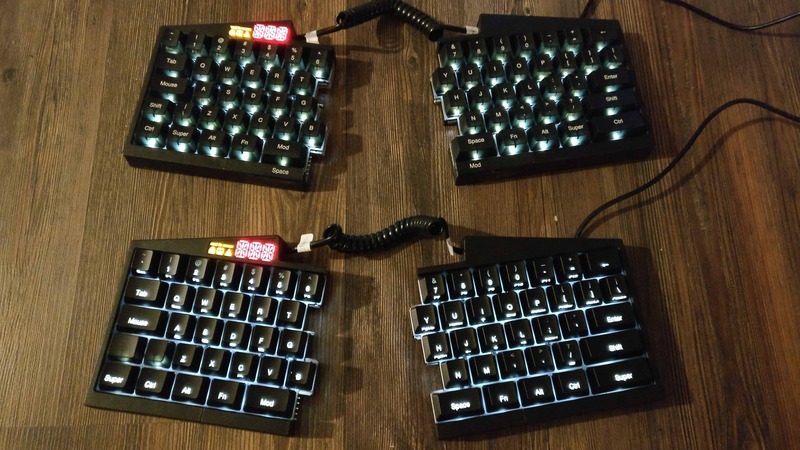 Will one be able to send his UHK in to upgrade it with LEDs? Will it be possible to send in your UHK to have it upgraded with LED's? I'm sorry, but we don't plan to offer such service. It'd be very cumbersome from a mass production standpoint. Will there be a video on how to do it or do you have one already? Any tips on the right kind of soldering iron/tip for the job? I do have one but it might be a bit big for the task. And will there be PBT caps with see-through letters on top availabel with the LEDs as well? Yes, we'll create a video on it, but it'll only really make sense when offering the upgrade kit with keycaps included. Any temperature controlled soldering should cut it. First, we plan to release laser-engraved keycaps, and possibly later PBT keycaps, too. My very best wishes for the New Year and may you sell heaps of UHK! So, finally managed to get my order through at Crowd Supply, the site had a little problem with my Mastercard it seems. I got me the beautiful palm rests as well and all of the modules. I'll be looking forward to collecting any modules that might be released. I find this to be a really exceptional keyboard and a thing of beauty! I'll also be ordering the white LEDs and PBT keycaps when they are released. I hope that one will be able to enable per-key lighting through the software in order to illuminate the assigned keys for the layer. Would make the learning curve for the layers much faster I imagine. Thanks so much for the nice words and your support, Pascal! We'd love to implement per-key and per-layer lighting eventually. I’ve been keeping tabs on the backlight feature to be implemented for only a short while, but I see that it’s now been approximately 1.5 years since customers had mentioned the LED requests. How are you going with the prototyping? Do you think that you might be able to release a version utilising LED backlighting by the end of 2018? Hi there! We'll offer an RGB backlit UHK eventually indeed, but certainly not in 2018. We don't have a solid ETA on this. On the other hand, we plan to gauge interest about the backlight update kit soon, and offer it as a separate product in our webshop.